Around the year 1212, Chiara di Favorone di Offreduccio felt drawn by a powerful stirring of the Holy Spirit to live the Holy Gospel of Jesus more fully. She left her Umbrian home in Assisi to follow a Christ-filled man named Francis. This same stirring of the Spirit that called Clare forth continues to live in her daughters. In fact, without her charism, the grace she received through the Holy Spirit, still living in her members, we would cease to be. Those of us who live her Form of Life today are entwined in a saga of many thousands of valiant women who have channeled its spirit to us. Beginning with the Damianites of the 13th century who carried on after Clare, we are heirs to a tradition of prayerfuness initiated by our earliest members like Clare’s sister St. Agnes, Bl. Ermentrude of Brugge, Bl. Helen Elsemini, and Bl. Philippa of Mareri. We have been made strong by the endurance of dedicated peasant women with strong hands and backs who composed a greater portion of our membership. But we were also formed by the dignity and gentleness of many royal or noble ladies, like St. Agnes of Prague, a princess, St. Kinga, daughter of the King of Hungary, along with a host of noble ladies. All were equal in Clare’s communities. We have been born of the faith and strength of our 74 proto-martyrs of Antioch in 1268, and by more than 150 others who also witnessed to their love of Christ with their lives in that century alone. The 14th. century was the time of our greatest expansion; we grew to 15,000 members. Three-hundred houses were added to the 110, or more, existing before Clare’s death. But our success brought us wealth and power and, like other great Orders, we drifted from our ideals. The 15th century has been called the “Second Franciscan Spring.” This revitalization of the entire Order was brought about through the collaboration of Friars and Clares. We owe our successful reform at that time to the initiative of the Observant Friars, who included us in their efforts to return to the spirit of our founders. At this crucial phase of our history, the Clares displayed extraordinary leadership through holy and capable women, like Bl. Antonia of Florence, Felice of Milan, Cecilia Coppola, St. Eustochia of Calafato, Seraphina Sforza, and others, who led the way to renewal in Poor Clare monasteries of Europe. We owe a great deal to these reformers, as well as to St. Colette of Corbie, who traveled around France to reform our Order there. We have been inspired by pioneers of the spirit among us like St. Camilla Battista Varana (+1524), who contemplated Christ’s passion beyond His physical pain and entered into the deeper sufferings of Christ’s heart. She is considered forerunner of devotion to the Sacred Heart of Jesus. We have benefited from women of the arts among us, like St. Catherine of Bologna (+1463). Her paintings and calligraphy are preserved in Art Galleries of Spain and Italy. Her writings on the spiritual life transformed her monastery into a center of spirituality. Less is known of her music on the viola, but perhaps she’s a likely candidate for patroness of guitarist. Our minds have been formed by scholarly women like Caritas Pirckheimer (+1532), who exerted a lasting influence on the 16th. century. As an educated person herself, she persisted in teaching her sisters scripture, theology, and the writings of the Fathers of the Church, in Latin and German, all subjects women were not considered capable of understanding in those days. It was the foundation of these studies that enabled Caritas and her sisters to stand boldly when every kind of force was used to make them abandon their Catholic faith. Through it all she composed her spiritual writings. We have been strengthened by her fearlessness and that of others, like Joanne of Jussie, who also wrote boldly in defense of her faith. Some writings of these courageous women are extant, though not presently available in English, while others lay unedited in monastery archives. We have been formed to be women with hearts big enough to hold the whole world and convert it to Christ. In the 17th. century the world’s first woman missionary to the Philippines was a Poor Clare: St. Jeronima of the Ascension. The Clares of the 17th. century also led new reforms to call us back to the highest ideals. Among these women were Mary of Calvary in France, and Frances Farnese in Italy. Luise of the Ascension (+1649, Spain) was known as La Monja de Carrion. [The nun of Carrion.] She was another Clare who exerted a powerful influence upon her society. Luise was brought before the Inquisition because of the popularity of her writings. Her name could never be erased from the loving memory of the people. We have been formed by the heroism of victims of the French Revolution in the 18th. century. Bl. Jeanne le Royer and whole communities suffered years of imprisonment and exile bravely. Bl. Josephine Leroux was martyred for the faith. Our spirituality has brought forth many extraordinary mystics who recorded their spiritual journeys. Among them St. Mary Magdalen Martinengo, whose volumes are now being edited, and St. Veronica Giuliani, a stigmatic of the 18th. century, who penned 14 volumes already widely known and studied. Marie Dominique Berlament was a 19th. century Poor Clare with an extraordinary desire to spread our charism throughout the world. She simply traveled about founding new Monasteries. On the other hand, Sister Marie-Celine of France was a just a young novice of 24 who never went anywhere. But she fulfilled a long life of total dedication to Christ in a short time, leaving a model for those considering a call to be a Poor Clare today. This was the century that gave us the missionary spirit of our own Mother Maddalena Bentifoglio and her sister, Constance, who were sent by Pope Pius IX and the Minister General of the Franciscan Order, Bernardino de Portoguaro, to bring the primitive Rule of St. Clare to the United States. We still recount stories of Mother Maddalena’s loving kindness amid deep sufferings. This more immediate experience within memory of at least some of us has enabled us to actually feel the vibrations of a charism being handed on. Old martyrologies still hold the records of over 800 outstanding Clares, most of whom we’ve never heard of. Hundreds of books or monographs about these women, or their writings, are scattered throughout the world. We do well to keep our eyes on the example of those forerunners of our Order, and on the early events that shaped us, but we can’t rest there. The continuing work of the Spirit among us today is no less colorful to relate. The vocation story of a north American Poor Clare, Bernadette of Texas, and another recent autobiography of the fascinating journey of Mother Veronica of France repeat the story of the call to be a Poor Clare today. The missionary spirit of the countless Clares who leave their homes, families and friends to bring our charism to other nations witnesses even now to the life-giving thrust of the Clarian charism. We have received our charism from Clares we will never know about, all those whose life stories are not so famous, but who passed the Clare-flame to us. And we receive the gift from those we live with who have influenced us intimately by their daily living example of fidelity. In Clare’s garden of consecrated women we have much to celebrate! Throughout the 20th. century our life-giving legacy continues in exceptional Clares like Marie Imelda of the Eucharist, born and raised right here in Marlboro, Massachusetts. Her community in Canada wrote of her exceptional holiness. And we see it in a biography written by our sisters in Africa concerning 24 year old Sister Clare of the Eucharist who died of cancer in 1984. The women who follow Clare today strive to be “models and examples” of Gospel poverty and prayer, that Clare wanted us to be, and to offer the service of loving intercession with God for the needs of all. But we want to renew, strengthen and celebrate the expression of our contemplative form of life in this grace-filled time in which we Clares of Boston are privileged to live, so that it will be an ever greater source of life for our city and our world. Our Holy Father, Pope Francis, is calling upon contemplative nuns today to be “beacons for the Church. We are being summoned to be, as Clare would have us be, “mirrors and examples” for others of the union with God for which people are longing. Clare was, very likely, riding the momentum of the 13th. century “women’s movement,” when she dared compose a religious Rule – something no woman had done before. We are striving to make our life, too, reflect women’s advances in our society, where intellectual and digital technology has long replaced skills in fine needlework expected of women who entered 60 years ago. We can only do this by the inspiration of the Holy Spirit that comes from a renewed centering upon the graces of Clare’s charism. Our particular form of Franciscan contemplative life, spanning so many centuries as it does, bears witness to the presence of certain catalysts for spiritual growth inherent in the following of St. Clare of Assisi. Her graces are woven like threads throughout the lives of each living Clare, creating unique patterns in each of us. It’s all in our hands now. Those who follow Clare are challenged to be especially present to the world at this great moment of humanity’s spiritual ascent, as the life-giving fountain Clare was for the people of her day. We celebrate this energy and are working to direct it into this new millennium. We need a few more good women. Will YOU join us? Sister Mary Francis Hone, O.S.C. 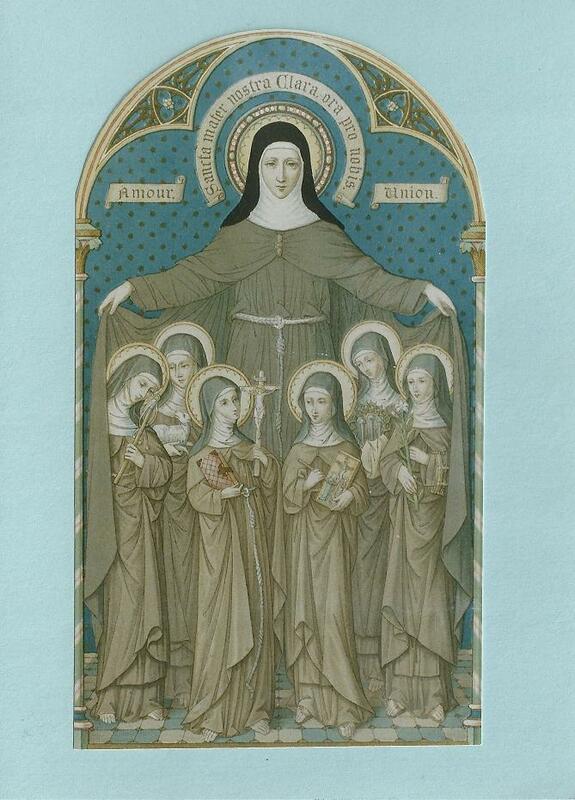 “Clare of Assisi: A New Woman.” Letter of the Ministers General. Franciscan Publishers.